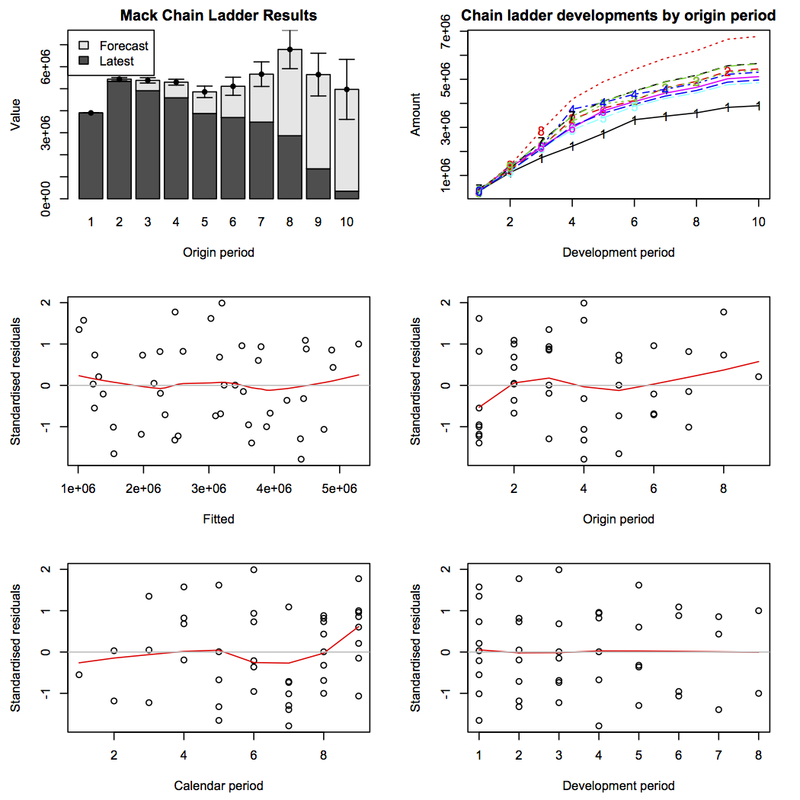 Last week we released version 0.1.5-6 of the ChainLadder package on CRAN. The ChainLadder package provides statistical models, which are typically used for the estimation of outstanding claims reserves in general insurance. The package vignette gives an overview of the package functionality. The list output of the MackChainLadder function now includes the parameter risk and process risk breakdowns of the total risk estimate for the sum of projected losses across all origin years by development age. The Mack Method’s recursive parameter risk calculation now enables Mack’s original two-term formula (the default) and optionally the three-term formula found in Murphy’s 1994 paper and in the 2006 paper by Buchwalder, Bühlmann, Merz, and Wüthrich. A few more Mack Method examples. The phi-scaling factor in BootChainLadder was incorrect. Instead of calculating the number of data items in the upper left triangle as n(n+1)/2, n(n-1)/2 was used. Thanks to Thomas Girodot for reporting this bug. Please get in touch if you would like to collaborate or find any issues or bugs. Join me at the first R in Insurance conference at Cass Business School in London, 15 July 2013.